rec. Chapel of St Mary’s College, Oscott, Birmingham, 9-11 June 2015. DDD. Chamber organ A=415. Temperament: Vallotti. Here is yet another typically enterprising release on the Toccata label. All but a handful of the items are claimed as first recordings and even those which are not are hard to find: there’s a Brilliant Classics album containing one of the Tessarini Allettamenti and that’s apparently it as far as current availability goes. The only other current recording of any of the music of Bolis also comes from Peter Leech and his Harmonia Sacra, released in 2014 on the Nimbus Alliance label (Princely Splendour, Choral Works from C18 Rome: Recording of the Month – NI6273). 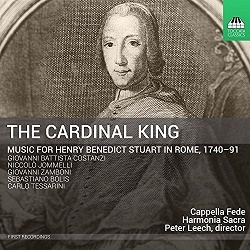 Harmonia Sacra and Leech have also recorded Russian Orthodox choral music (Cherubim and Seraphim, Nimbus Alliance NI6187) but this is his first recording with Cappella Fede, formed in 2008 and named in honour of the maestro di cappella to James II/VII. After the ‘Glorious Revolution’ of 1688 had sent the last of the Stuart kings, James II/VII packing and established the joint reign of his daughter, Mary, and Dutch Stadtholder William of Orange, a sizeable number of Anglican bishops and clergy considered themselves bound by their oaths of allegiance to refuse to accept the new regime. Known as ‘non-jurors’, they formed a significant, mostly high-church, offshoot until the deaths of all the other Stuart claimants left Henry Benedict, younger brother of ‘Bonnie Prince Charlie’, next in line – and he as a cardinal of the Roman church would hardly have been acceptable to the Anglican non-jurors. He was, however, a patron of the arts in Rome and these five composers benefited from his patronage. He also seems to have been an accomplished vocalist and cellist. Of the composers included here only Niccolò Jommelli is at all well known, with Sebastiano Bolis not even on my horizon as a name. Look at their dates and you might expect to hear music on the verge of or just into the world of Haydn and Mozart but sacred music in Rome was very conservative, often reminiscent of the music of the previous century, as in the case of Bolis’s Miserere (see below). There is, however, plenty of variety here, as evidenced by the first four tracks: Nos. 1-3 are graceful settings of absolution for the dying, the first on a text which Elgar set in his Dream of Gerontius. The mood changes with track 4, an Easter motet echoing the words of the angel to the women in the empty tomb. It’s given as Jesu quaeritis throughout the booklet but the vocative Jesu is ungrammatical: surely it should be Jesum (accusative) in apposition with Nazarenum: Jesus of Nazareth whom you seek has risen and is not here. That seems to be what is sung, too. Bolis’ setting of the psalm Miserere (track 10) is the longest work here and for me one of the highlights of the programme. Sung alternatim – alternate verses in Gregorian chant from a soloist and by a choral group – it’s much less elaborate than the ubiquitous Allegri setting of the same text, to which it makes a very fine alternative. In fact, it seems likely that the Allegri setting left the composer’s pen in the 1630s as a much less florid affair and that successive generations of singers in the Sistine chapel puffed it out considerably. This is one of only two tracks on which the two groups combine – Cappella Fede are alone elsewhere – and they do so to very fine effect. The following three tracks, devoted to one of Carlo Tessarini’s Allettamenti for violin and cello, Op. 3, dedicated to the 15-year-old Henry, make an attractive interlude after the intensity of the Miserere. Niccolò Jommelli’s Oculi omnium is another highlight of the recording. The text in itself is not particularly intense but it receives an intense setting from Jommelli and an appropriate performance. With Jommelli’s music comparatively well known – two works on Joyce DiDonato’s recent album In War and Peace, for example – review – I’m glad that this previously unrecorded piece was chosen. Little-known this music may be but the quality of what is on offer here justifies Toccata’s enterprise in making music which has ‘languished in obscurity’, to quote the booklet, much better known. These well-recorded performances fit the bill superbly and I hope to hear much more from all concerned. As usual with Toccata releases, not the least of the virtues of this recording is Peter Leech’s excellent set of notes: scholarly and informative.